Each year around now, the road to the state track meet starts to take shape. This year there is once again a fork in that road, where the memory-making seeds of rivalry were planted three years ago in District seven. The penultimate version of the Valley-Spur match-up has not disappointed, and it's only expected to get even better from here. Throughout their junior year, a story has been brewing about two competitors from District seven. Only 69.3 miles separate Jake Merrell (Turkey Valley) and Dustin Dominey (Spur). They have competed against each other in cross country, basketball, and track for three years. Both have state medals. Both have had challenges. It's no secret that Jake Merrell is an outstanding runner. Many are astonished at his times. 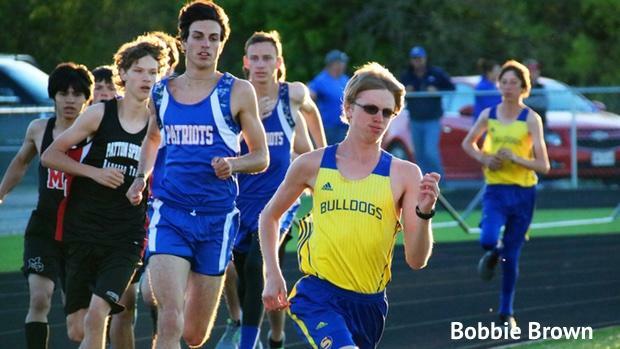 At 6-foot- 3, Merrell has a Texas sized long stride that pushes him past most competitors. In the fall, Jake experienced a foot injury that would test any athlete. While completing a power clean after football in the weight room, he injured his Achilles tendon. He was unable to participate in basketball and focused on the healing process. Although he's not 100 percent, Jake continues to amaze 1A track fans with his times this year. He currently sits atop the 1A track charts in the 800, 1600 and 3200. He is heading to the Region 1-A track meet on April 28th in all three events. "The biggest challenge for me as a runner right now is dealing with this injury," Jake said. "I want to put in a lot of work, and train really hard, but right now my foot won't take it, so my biggest challenge so far is dealing with injuries." A hop, skip and long jump away in Spur, Dustin Dominey earned a gold medal at the State Cross Country meet. At 5-foot- 6, he focuses on foot speed to compensate for the stride length of taller competitors. "I have a lot shorter strides," Dustin said. "It all boils down to mental toughness. When training I try to focus on the speed of my stride to compensate for the length of his." And just like Jake, Dustin had to find something inside himself to climb to the top of the heap. Dustin's challenge is an eye condition he's had since infancy. When he was 3 months old, a cataract removal from his right eye left him with hand-eye coordination problems. While Dustin is unable to play football for risk of losing his sight completely and basketball is difficult, he has willed himself to the top of the heat-heap in track. He is in the 1A top five state-wide in all his running events and will compete in the Region 1-A track meet in the 800, 1600, and 3200 races. "I strive to be the best in the sports I am allowed to participate in," Dustin said. "I have to have a lot of mental toughness in order to get through practices when it would just be easier to quit." 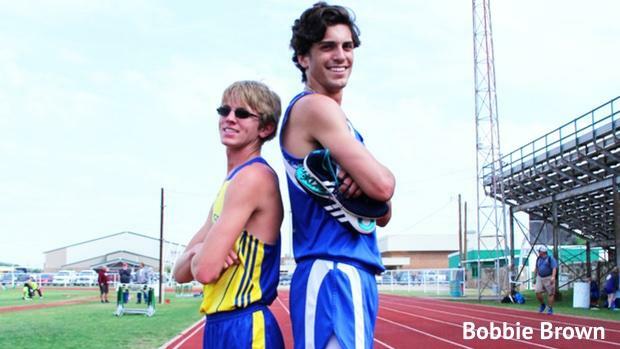 The friendly rivals plan to continue running competitively after high school. Jake is leaning toward Baylor while Dustin is still evaluating his options. But they do have something in common: Resolve, because both have had challenges but mental toughness has prevailed. And while they appear different at first glance, any fan will notice them in lockstep at the top meets -- both leading the pack, and at the finish line. I wouldn't say we are close friends, no doubt he is a good guy and we both have respect for each other," Jake said. "But when it's time to step to the line in race, we both know it's time to compete." And compete they will. Look out, Austin.